Not to be confused with the live-action film studio DreamWorks and the disambiguation page DreamWorks (disambiguation). Dreamwork differs from classical dream interpretation in that the aim is to explore the various images and emotions that a dream presents and evokes, while not attempting to come up with a unique dream meaning. In this way the dream remains "alive" whereas if it has been assigned a specific meaning, it is "finished" (i.e., over and done with). Dreamworkers take the position that a dream may have a variety of meanings depending on the levels (e.g. subjective, objective) that are being explored. According to psychoanalytic view to be able to understand dreamwork fully, a person needs to understand how the mind transfers the latent thoughts to manifest. The first step is called condensation, and it is the combining of different unconscious thought into one. The combining of the unconscious thoughts makes it easier for the mind to express them in the dream. The step of condensation has two sub-steps, day residues and censorship. (On the other hand, according to Ullman and Erich Fromm dreams have no censorship at all). Day residues are left over daily issues that bring up some unconscious thought. The mind then displays this thought through a similar situation from the day. Before the unconscious thoughts can be displayed they are censored. Since many unconscious thoughts do not follow the moral code of society, the mind changes them to be more respectful. This is done so that it does not cause the dreamer anxiety and therefore wake them up. It is also due to censorship that multiple unconscious thoughts are combined, since it is hard to just have one slip through. After condensation, another step in the formation of dreams is displacement. This is where the dream may direct feelings or desires onto an unrelated subject. 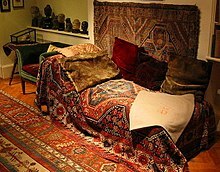 This is similar to the practice of transference, which is a common technique used in psychoanalysis. Another step in the formation of dreams is symbolism. Objects or situations in a dream may represent something else, commonly an unconscious thought or desire. The fourth and final step in formation is secondary revision. In this step, all the thoughts are put together and are made coherent. Also another point of this step is to make the dream relate to the dreamer. These four steps put together make up dreamwork. People who study the formation of dreams and then analyze them are called dreamworkers. As mentioned before, dreamworkers must work backwards from the conscious to the unconscious. Since they are not the ones who saw the dream, they use among a variety of methods, depending on the background of the dreamworker, also free association with their clients. Free association is where the client describes the dream and relates as many aspects of it to their life as possible. The dreamworker listens intently and once they have gained as much information as possible about the dream both through the dreamer's description of the dream and through the dreamer's emotional status, they may be able to understand the dream better and to gain information about the dreamer that they may not be aware of or be willing to share. ^ Cloninger, Susan (2008). Theories of Personality: Understanding Persons. New Jersey: Pearson Prentice Hall. pp. 81–82. Funkhouser, ArthurYour Dream Cow is not as I Imagined it to be, Primary Care, 2013. Krippner, S. Dreamtime & Dreamwork, Jeremy P. Tarcher, New York City (1990). Sowton, Christopher Dreamworking: How to Listen to the Inner Guidance of your Dreams, Christopher Sowton, Llewellyn Publications,Woodbury, Minnesota, (2017).